In my last blog post we established the need for continuous improvement; let us now look at how a testing professional’s role has evolved. This will give us a better idea of the kind of retraining and improvement required from a testing professional. Originally, in the waterfall context, the tester was often a part of a test department sitting in isolation where they would get the software thrown over the wall when it was ready for testing. Today, methodologies such as agile have brought about integrated teams where there is often only one tester in the team. In such a situation, the need to understand our craft is much more today as not only are we often on your own but we also need to coach our other colleagues on testing. Some of my testing colleagues today are acting as scrum masters and testers as well as being test coaches to their teams. Basically, the adoption of methodologies such as agile and DevOps have led to a blurring of boundaries between development and testing. This means that a testing professional today often needs to be skilled in aspects other than testing. In other words, testers today need to develop a T-shaped profile. This basically means that in addition to having a deep knowledge of your core domain, you also need to have a broad knowledge of a number of other areas. So for instance, a tester needs to not only have a deep expertise in testing but also have some knowledge of software development, project management, business as well as technology. The first step is to sit down and make a plan. You need to ask yourself where your interests lie. What are you passionate about? The field of testing itself is fairly broad, so you need to be very clear about where you want to go before you start working on a plan for your learning. Which field of testing are you interested in? Do you want to dive into automation, performance testing, security testing or context driven testing, are you focusing on test engineering or test management – where is your passion? These are some of the basic questions you must answer before you start developing your plan. Once you are clear about your development goals, then it’s time to sit down and make a plan, or rather, what I call a bucket list. 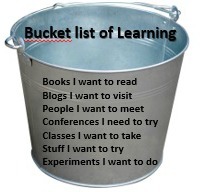 The bucket list is like a training wishlist and it includes things like books you want to read, blogs you want to follow, people you want to meet, conferences you want to participate in and so on. The bucket list need not include dates but is essential, a wish list of the ways in which you want to train yourself. In order to create such a bucket list, you will also need to think through and understand your own learning style. The thing is that we don’t all learn the same way. Some people learn the best by reading a book, some need to experiment, ‘some need to learn by doing’ while still, others learn through discussion. So you need to ask yourself- which way do I learn the best? What you put on your bucket list will depend to a large extent on how best you learn. If formal training is on your bucket list, it is important to do a thorough research on options available before you shell out your hard-earned money on a training course you know nothing about. Before you commit to paying money you should at least have done enough research to know if that training course is really something that interests you. Just as there are paid courses and certifications, there are also a lot of free resources available from YouTube videos to sites like www.coursera.org. Keep in mind that classroom learning or online courses are not the only way to go. You could also start just by joining communities in your area and networking with peers. Participating in conferences or reaching out and finding mentors is also a wonderful idea. In my experience, people are always willing to help and the only thing required is to reach out to them. So don’t be afraid to ask! You can also learn by participating in competitions and going to events. For instance, we in CapgeminiSogeti Denmark have been organizing events called Test Hackathons for the last couple of years. These are events where we invite test teams from different companies across Denmark to join in for a day of testing. It’s a team competition that offers a lot to learn and is also an excellent opportunity to network. Research all of these options before you build out your bucket list and decide how to fulfill it. – Take responsibility for your own learning: Once again, don’t wait for your company or your manager to approach you with a training course. Your career is your responsibility so be pro-active and cognizant of all the opportunities for improvement. – Think beyond traditional training courses: As we have discussed in detail, there is a multitude of training options available on the market today. So don’t just be hung up on certifications, or classroom training but keep an open mind when it comes to training. For instance, even mentoring others can be a legitimate way of learning as I myself have learned. Oftentimes, the questions asked by those I am coaching have led to new and unexpected insights. In short, broaden the way you think when you think about learning. So what’s stopping you? Think through where you want to go, create that bucket list and take that first step towards a more rewarding and meaningful career.